From left to right, Rep. Jesse MacLachlan, Essex resident Suellen McCuin, Chris Cryder of Save the Sound, Kate Brown of The Trust for Public Land, Sen. Paul Formica, Rep. Phil Miller, Sen. Art Linares, Rep. Devin Carney, Rep. Terrie Wood, Jim Millard of The Trust for Public Land and Lori Fernand of The Trust for Public Land. Five state legislators, State Senators Art Linares and Paul Formica, and State Representatives Phillip Miller, Devin Carney and Jesse MacLachan have applauded the Jan. 12, approval of a $2 million state bond issue to assist in the acquisition of the Preserve. The Preserve property consists of 1,000 acres along the shore of Long Island Sound that is presently open space. Voters in Old Saybrook authorized the town to provide $3 million in funding to purchase a portion of The Preserve located in Old Saybrook and a small piece in Westbrook. 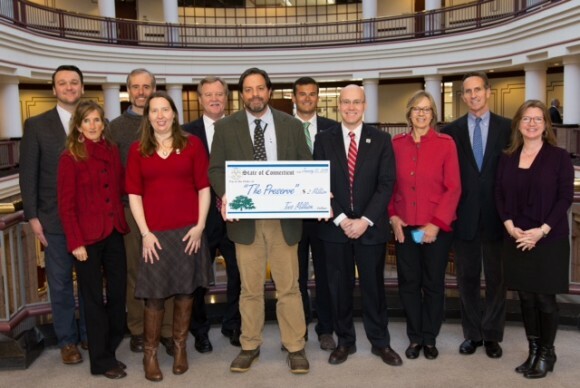 The Trust for Public has also raised an estimated $1.2 million to cover the final portion of funding for the purchase, and the Essex Land Trust has agreed to purchase 70 acres of land in Essex that is a portion of The Preserve with the help of a $471,250 open space grant from DEEP. One of the numerous vernal pools found in The Preserve. Photo by Jerome Wilson. The Preserve consists of approximately 1,000 acres of land along Long Island Sound in three towns: 926 acres in Old Saybrook; 71 acres in Essex; and four acres in Westbrook. The Preserve includes 38 vernal pools, 114 acres of wetlands, more than 3,100 linear feet of watercourses, high quality coastal forest, and an Atlantic White Cedar swamp. The dense canopy of forest and the Pequot Swamp Pond act as a critical refueling stop for many migratory birds, and the many freshwater seeps on the property are home to amphibian species such as the northern dusky salamander, spotted turtles, and box turtles. In all, more than 100 species of amphibians, reptiles, mammals, and birds thrive on this property, some of which are state-listed species of special concern and others of which are declining in other areas of the state. In addition to its recreational and habitat resources, The Preserve provides important water quality benefits to residents. Surface waters on the property drain to three different watersheds: the Oyster River, Mud River and Trout Brook, as they make their way to Long Island Sound. The protection of The Preserve will ensure that storm water on the site is recharged to local aquifers. An aquifer protection area is located just east of the Preserve and supplies an average of 200,000 gallons per day of drinking water to Old Saybrook and surrounding communities. The Preserve also offers benefits for coastal resiliency in the face of climate change, and conservation of it will ensure lessened storm water impacts from hurricanes and other intense storms. 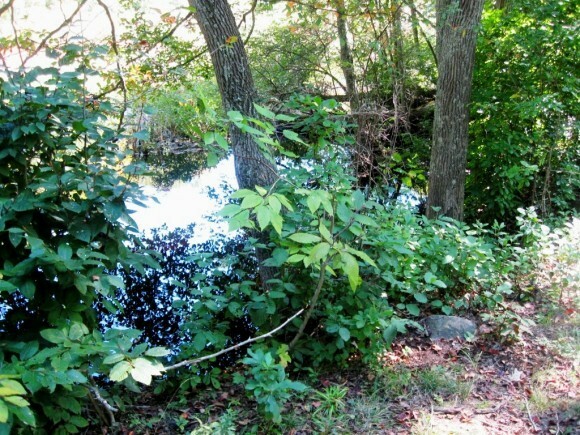 The Preserve acts act as a sponge for storm water, releasing it slowly into the tributaries and rivers that lead to the Connecticut River and Long Island Sound, protecting downstream property owners from flooding. Editor’s Note: This article was prepared directly from a press release issued by the House Republican Office.